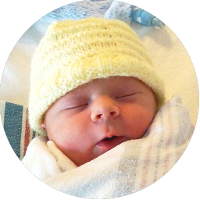 Home / News / YOUR HEALTH welcomes Benjamin Morrison to the family! Dr. Leann’s son, Benjamin Gerald Randle Morrison, was born March 27 at 12:19am, weighing 7 lb 11 oz and measuring 19 inches long. Hannah’s big sister duties have officially begun!